Reference and Web Services Librarian Angela Vanden Elzen helps a strudent use the 3D Printer in the Makerspace, located on on the first floor of the Seeley G. Mudd Library. This column is intended to inform students and other members of the Lawrence community about the resources and events that are offered at the Seeley G. Mudd Library. This is a source for little-known library facts, staff spotlights and investigations into the archives of Lawrence and Milwaukee-Downer College. For hands-on projects and innovative technology, Lawrence students should be sure to familiarize themselves with the Seeley G. Mudd Library Makerspace. The Makerspace provides many opportunities for students. Some of the machines available for use after training are 3D printers and scanners, a sewing machine, vinyl cutter and soldering machine. Editions of Make magazine, which the Library subscribes to, are available for inspiration, and a club meets in the Makerspace room on Thursdays at 7 p.m. to use the soldering machine and engage in other creative endeavors. Students in an Innovation and Entrepreneurship (I&E) course have made use of these resources to create prototypes of products they have designed this term. These resources are also coming in handy for senior projects, and one student has even made use of the soldering station for the creation of a self-driving car. 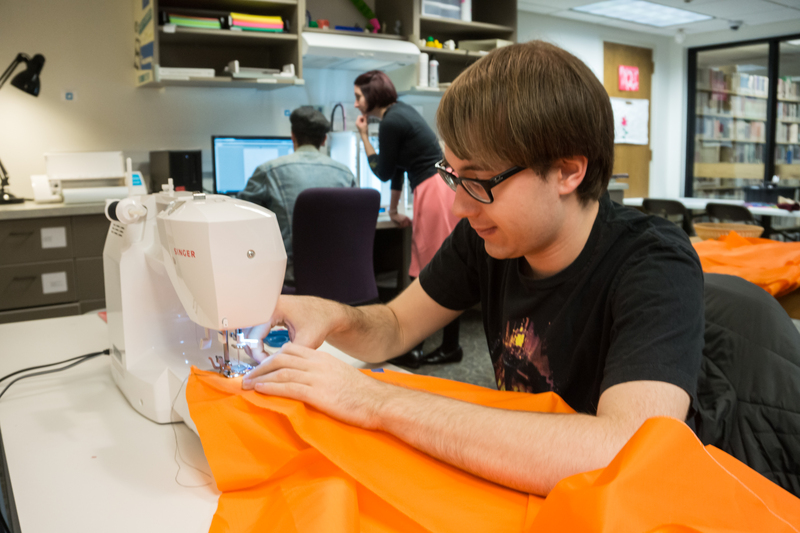 Set up two years ago thanks to a faculty career enhancement grant, the Makerspace has since “morphed into something a lot more student-centered”, which Reference and Web Services Librarian and Assistant Professor Angela Vanden Elzen feels is beneficial. She also explains that this space provides “more of a creative kind of outlet” for anyone, not just those in classes which professors specifically brought in for training. Along with Instructional Technologist Arno Damerow, Vanden Elzen runs Makerspace training. While Vanden Elzen “[tends] to be the one that manages the day to day usage of the space,” Damerow is “really good at 3D printing and design…[and] definitely helps out a lot with training.” There are many components to a student’s Makerspace training, although the length of a training session depends really on what the students want to learn. “Sometimes it can be 15 to 20 minutes, but with 3D printing usually it’s around 40 minutes to an hour,” Vanden Elzen commented. Students are given important instructions on what different areas of the space are used for, safety precautions and of course how to use the many machines available for creative projects. “If a student comes in and says ‘I just want to learn how to use the sewing machine’ then we’ll run a demonstration with that, and [the same with] students who just want to run the electronic cutter.” Van Elzen continued the list of possibilities for student training with perhaps one of the most exciting new technologies available: “[Students] also learn how to go about the process of finding a 3D model and preparing it for the 3D printer, and we get the 3D printer and run a demonstration, which is why we have so many tiny things over there,” Vanden Elzen said, motioning to an array of cheerily colored little figures clustered behind one of the 3D printing machines. The Makerspace is even “attracting national attention”, according to Vanden Elzen, who explained that a group from the University of Texas Arlington has expressed interest in collaborating with Lawrence to “[come] up with a set of maker literacies, and they want to have partner schools to use these maker literacies,” according to Vanden Elzen. Students should be sure to make use of this free opportunity. After attending a training, card access to the Makerspace room is provided, and students may make use of the room during all library hours. Trainings are available on Mondays at 2 p.m. and Thursdays at 11 a.m. in the Makerspace room, located on the first floor of the library in the back by Technical Services.